Each year we seem to have our issues with plants and flowers that we try to grow. Two years ago we tried sunflowers and a bunny family attacked them. We bought some natural pepper spray to keep them away. Last year we planted some more sunflowers and lily plants in pots on our front patio. Although safe from bunnies, the neighborhood flock of birds seems to enjoy destroying them. We have been discouraged, but have never given up trying new things each year. In April for Earth Day we planted some daffodils and then soon after more gorgeous lily plants. The daffodils did really well until the heat wave at the end of April and start of May. The flowers went away, but we knew that next year we would have more gorgeous flowers. Unfortunaltely, that pesky bunny family is back. They have destroyed the daffodil plants and even the bulbs were pulled up. Grrrrr! After we were home from Disney World we decided to try planting some other items in big pots on our patio. At first we bought two tomato and one jalapeno plants. Then NHL and JL went out and bought a zucchini, cucumber and peppermint plant to add to the mix. 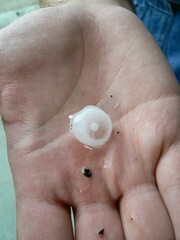 Thanks to the constant rain, and even some hail (seen below), the plants have had a tough time. 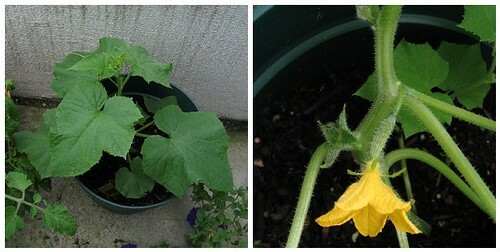 The cucumber plant has been hit really hard, along with one of the tomato plants. The odd thing is the cucumber plant has gorgeous flowers each morning in recent days. The other tomato plant has a lot of flowers, but nothing visible in the fruit department just yet. Two days ago I took a closer look at the zucchini plant and noted that there were the start of five or more little vegetables growing. They really are so cute! With any luck the weather will cooperate a little more, the animals will stay away and soon we will have some fruits and vegetables that are home grown to enjoy. 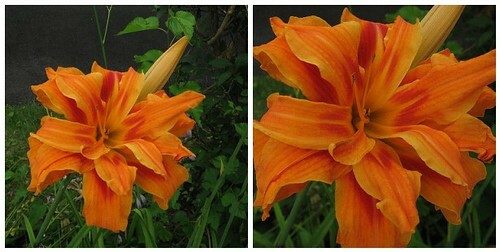 For now I will continue to enjoy the gorgeous Tiger Lillies that are also spreading along the side of our house. Who knew, I actually like something that is orange! I’m sorry about the troubles you’ve had with your garden … but sometimes nature’s surprises can be so fun! I Love your flowers and veggies!